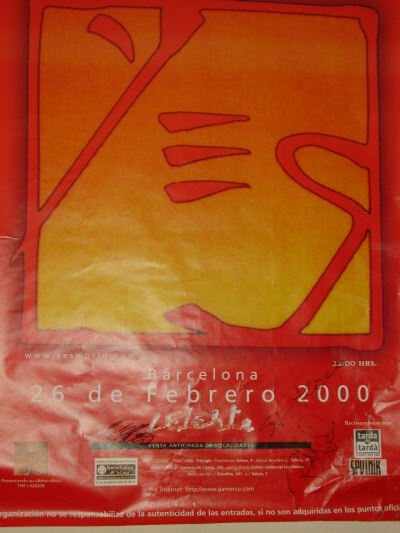 Realmente un concierto como siempre para el recuerdo, lastima que los promotores los lleven a cualquier antro. Zeleste is a cavernous, dark, hall in a converted factory. Very rough and unadorned. Very industrial in feel but with a great atmosphere. It was packed out, but we could move around a bit and were always close to the stage with a good view. Steve Howe like Corum or Elric from the Moorcock books, looking slightly elfinlike and thin. He nearly smiled twice, I�m sure of it. Jon floaty and clearly a bit tired from the tour, but in excellent voice and with a nice way of moving that reflected the music. Chris BIG and hulking in short trousers and medical type coat. Enjoying himself immensely and swigging beer between songs. AW intense and enjoying every minute, Igor and the new bloke likewise. Yours is no disgrace (dipdipdipdipdipdipdipdooahgive peace a chance) then Jon �I don�t know where this is..oh thanks..well tonight, this is the house of YES)�. Followed by, among others, Homeworld, It�ll be a good day, Lighting strikes, & You and I, Awaken, All good people, then Clap and Roundabout and OOALH (ow) for the encore. I wasn�t making a list but it was a shorter set than the AH. The catalan crowd loved it. At times the wall of sound shimmered and grew and expanded to enter strange worlds, then looped back to the ground. Juliet and baby inside loved it. After the gig we wandered around the industrial area that is Poble Nou. Loads of people out on the streets with the Catalan nightlife just kicking off at 130 am. We found this gigantic factory floor room that had been confverted into a giant bar (like at Oktoberfest sort of thim�ng). Packed out. Barca comes alive at night. 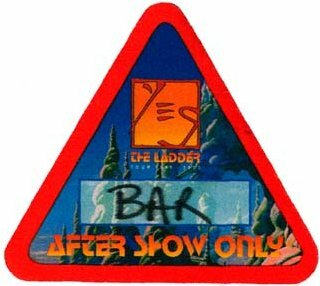 Thanks to Yes for visiting. it was a great gig. Jon's voice in perfect shape. Chris bass outstanding. Billy is a wellcome asset. Igor made me hope for the future. Alan plays drums as if he were 20 years younger. The choice of music couldn't be better. No lengthy solos, we wanted to see the Band and that is what we got. Just hope that they don't take another 14 years to return to Barcelona.